Garage rocker Mike Krol plays and sings with the uncontainable excitement of an underdog finally realizing his dreams, and the album courses with the adrenaline of newfound confidence. The record has a do-or-die desperation. The sound is scuzzy, but the energy is pure. When he whines and shouts lines like you've been warned that I'm not fooling around, you believe him. The song that line comes from is called Neighborhood Watch, and it's sung to somebody who stole his bike. This is one of his strongest suits; taking a small and seemingly silly premise, making it universal and hiding at least one line in each song that could be pulled from it to form a mission statement. Engineer Beau Sorenson improves upon the sound of the first two albums, without compromising any of the shambolic glory. Instruments are panned hard, handclaps occasionally emerge through thick fuzz and squalls of feedback, and at the center of it all is Krol's nasally voice, singing sweet melodies through a guitar amp and hitting effects pedals at just the right time. He sings with the uncontainable excitement of an underdog finally realizing his dreams, and the album courses with the adrenaline of newfound confidence.  Pitchfork.com Simplistic lyrics about suburban boredom and youthful abandon? Tick. Muffled, loudspeaker-style vocals? Tick. Guitar that may as well have been played with a cheesegrater? Tick, tick, tick. Theres a proliferation of quirky dudes that make music like this  lo-fi garage-punk that sounds as if its been recorded in a tin can and spliced on to cassette tape. 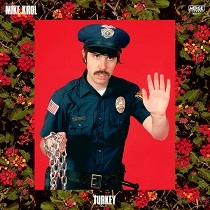 But theres something irresistibly fun about Mike Krols and not just because hes dressed up like a camp cop (looking like Ben Stiller) on the album cover, replete with a moustache and grasping a chain in his hand. He smothers his elastic power-pop melodies with punishing distortion. He is hardly a rocknroll virtuoso, but he knows how to make carefree music to make you bounce. Sometimes thats enough.  TheGuardian.com Its a catchy and fun record thats got hints (to our ears) of Kurt Baker (his punkier side) and Ryan Allen throughout! EXCELLENT! !